6 week Krav Maga training in a small group! In this 6 week Krav Maga challenge, you will learn the basics of Krav Maga in a small group with personal attention. However, “basic” does not mean easy. Not only will you learn self defense skills, you’ll get a great workout! 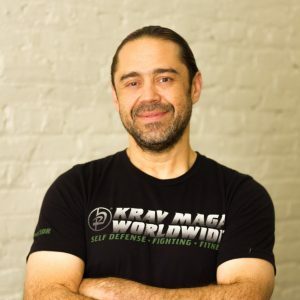 Krav Maga is the most practical, functional self defense system in the world today, giving students skills they can use immediately such as situational awareness and neutralizing common attacks like chokes, headlocks, grabs and punches. Based on natural, instinctive movement, Krav Maga is accessible to almost everyone. This adaptable system is designed for people of all ages and fitness levels to build confidence and learn real self-defense for life. At the end of 6 weeks, you will take and pass a test on the Level 1 material and will be qualified for Level 2. I love the instructor from my first class. I felt so much more confident with my teammates. We’ve always worked together. I’ve gained new friends who inspire and motivate me to be better. I’ve lost 16 lbs without any strict diet. For me, the 6-week-challenge is just the beginning. Now I’m truly addicted to Krav Maga and overall fitness! I chose the 6 week challenge for a bit of extra structure, and I felt like signing up for a course would be a great way to kick-start my learning. I had never studied any martial art or self-defense system and the idea of jumping in was a bit intimidating. I loved it from day one! Instructor David showed us how to throw good groin kicks, and hammer fists punches in a controlled, aggressive manner. I really enjoyed learning correct striking technique and footwork. He made us feel welcome, he was very encouraging, and he kept all of the classes fun. I really loved the fact that it was made up of people from all walks of life, different backgrounds, and pretty evenly distributed between men and women. At the end, I felt ready and eager to learn more, continue to progress in both my fight skills as well as in overall fitness. Special bonus: Try out all our other classes during the 6 weeks!